As a result of its location on the east coast of Vancouver Island at 49°N latitude, Nanaimo has mild wet winters and relatively dry warm summers. However, occasional outbreaks of modified Arctic air during the winter result in minimum temperatures of about -10°C (14°F) in most years. This places it in hardiness zone 8a in the new map released by Agriculture Canada (but zone 8b in the old hardiness map from 1967).Due to the proximity of the ocean and mountains, there are many microclimates on Vancouver Island with remarkable differences in rainfall, wind and temperature. An even milder climate classifed as hardiness zone 8a is found on the smaller islands lying between Vancouver Island and the mainland as well as on the west coast of Vancouver Island. The accompanying figure compares the climate on the east and west coasts of Vancouver Island with that on west coast of Scotland which is famous for its rhododendron gardens. The Younger Botanic Garden at Benmore, 50 km northwest of Glasgow in Argyllshire, Scotland is part of the Royal Botanic Garden Edinburgh. Its mild winters and abundant rainfall provide very favorable growing conditions for species rhododendrons. 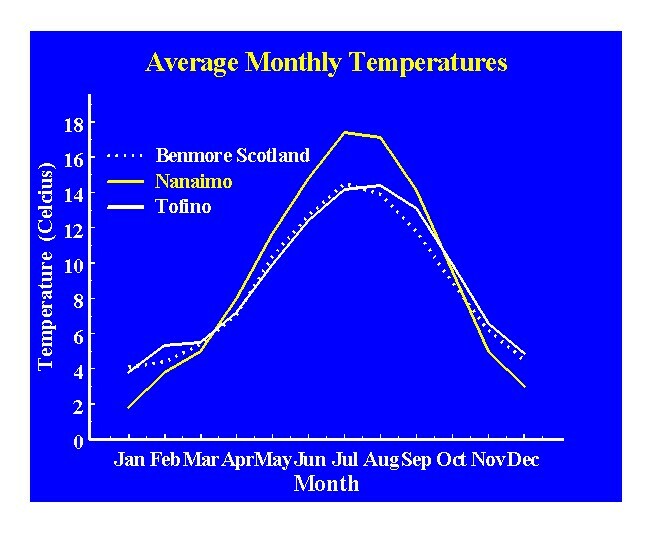 Average monthly temperatures for Benmore are shown together with those for Nanaimo airport and those for Tofino airport on the west coast of Vancouver Island.From the graph, it is obvious that Nanaimo has colder winters and warmer summers from May through September in comparison with Benmore. 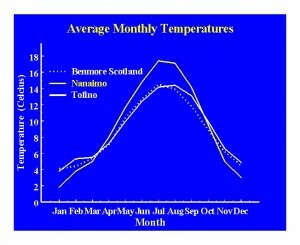 Average temperatures at Tofino are very similar to those at Benmore. The extreme minimum temperature at Nanaimo is -20 °C (-4°F) compared with -15°C (5 °F) at Tofino and -17°C (0°F ) at Benmore. The extreme maximum temperature for Nanaimo is 36.7°C (98 °F).Nanaimo also receives more sunshine: 1811 hours annually compared with only 1400 hours at Glasgow. Total rainfall in Nanaimo is 1144 mm (45 inches) compared with 2660mm (105 inches) at Benmore and 3288 mm (130 inches) at Tofino. Rainfall is much more evenly distributed throughout the year in Scotland than in Nanaimo. Nanaimo receives much less moisture during the growing season, only 138 mm (5.4 inches) of rain from June through September. This is not enough to offset evaporative losses during the heat of summer so irrigation is essential for best results with rhododendrons. From this comparison, it is evident that Tofino on the West Coast of Vancouver Island has more ideal conditions for growing rhododendrons than does Nanaimo. For an example, see the Mount Arrowsmith Rhododendron Society web page for a picture of the impressive rhododendron garden created by ARS Silver medalists Ken and Dot Gibson in Tofino. Although not as mild as Tofino’s, Nanaimo’s climate compares very favorably with that of the adjacent mainland coast. Gardens in sheltered locations in the Nanaimo region are able to grow sensitive rhododendrons including many of the large-leafed species. Temperatures are expected to warm considerably during this century with the further progression of climate change due to accumulation of carbon dioxide and other greenhouse gases in the atmosphere. Other effects projected for British Columbia include more frequent extreme precipitation events, drier summers and rising sea level.